Passed away unexpectedly and peacefully in her sleep Thursday, March 29, 2018, at her home. Age 87 years. June 4, 1939 at Sts. Peter and Paul Catholic Church. They were to celebrate their 69th anniversary this summer. John survives her. Catherine was a charter member of Holy Spirit Catholic Church where she taught CCD for 20 years. Catherine was always willing to help wherever there was need. She enjoyed square dancing and camping in past years. She loved playing cards and spending time with family. 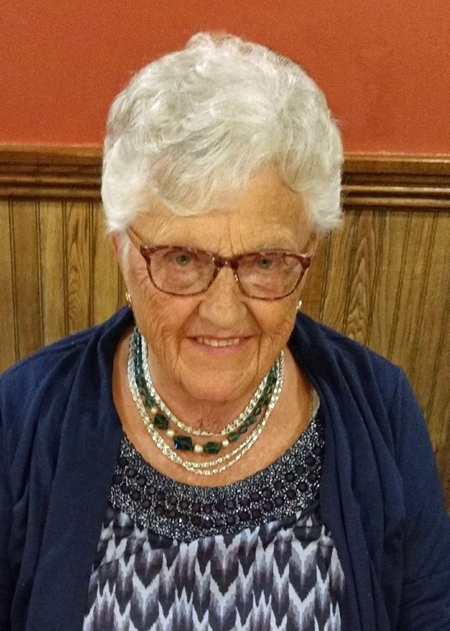 She especially took pleasure with her grandchildren and was able to care for them during their childhood years and babysat her great grandchildren as recently as 2 weeks ago. She was “Grandma” to many people over the years. She held various jobs in her lifetime, her favorite, was the “lunch lady” at Shields Elementary School. Many of those students still recognize her today. Surviving are two daughters and their husbands, Sally and John Majewski; Susan and Jeff Schmiege-Crabtree; four grandchildren and their spouses, Anthony Teets; Matthew Schmiege; Sarah and Tyler Marquez; Christopher and Gracie Rousse; her great grandchildren, Jacob and Justin Teets; McKenzie, Arabella and Penelope Schmiege; Samuel and Robert Marquez; Cora Rousse; two sisters-in-law, Betty Hartnagle and Patsy Beck; a special cousin and his wife, Wayne and Kathy Hubbell; many other cousins, nieces and nephews. A son-in-law, Brian Schmiege, and a sister-in-law, Delores Hodeck, have predeceased her. To send flowers or a remembrance gift to the family of Catherine Teall, please visit our Tribute Store.